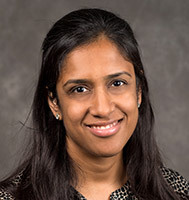 Dr. Kenkre is an assistant professor of medicine within the division of hematology/oncology at the UW School of Medicine and Public Health and at the William S. Middleton Memorial Veterans Hospital. She completed her medical degree at the University of Michigan Medical School in Ann Arbor, Michigan, and her postgraduate internship/residency training in Internal Medicine at the Tufts-New England Medical Center, in Boston, Massachusetts. Most recently, she completed her fellowship in Hematology/Oncology at the University of Chicago in Chicago, Illinois, in 2010. Dr. Kenkre’s clinical interests are in hematology, specifically lymphoma and bone marrow transplantation. Her professional organization memberships include the American Society of Hematology, the American Society of Clinical Oncology and the American Medical Association. Dr. Kenkre is part of the Lymphoma Disease Oriented Work Group, which focuses on improving therapeutic options for patients with lymphoma. She is interested in drug development and novel therapeutics for patients with lymphoma and improving outcomes for those patients undergoing bone marrow transplantation.